Teaching With Love and Laughter: A Winterlicious Educents Deal! I am so excited to be be collaborating with my fantastic Freebielicious friends on an amazing Educents deal! We have all included great products for the fall and winter season. You won't be disappointed! 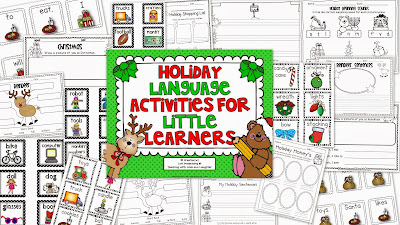 I know you will love my Holiday Language Activities for Little Learners. There are 21 other products in our bundle to get your kids learning! Literacy, math, science, social studies, and so much more! Follow the blog hop to see all the goodies you will get! Next up, Kinder Craze! All the best skills are covered in this packet Lori. Awesome as usual.